#1 in the top 25 Golf Courses in Wisconsin – 2017 Golf Advisor User Reviews. The adjacent championship golf course, Wild Rock Golf Club, is a must-play, quickly drawing the attention of golfers nation-wide since its inception in 2008. Wild Rock was designed by the legendary architectural team of Dr. Michael Hurdzan and Dana Fry, the duo who brought us Erin Hills, site of the 2017 U.S. Open. 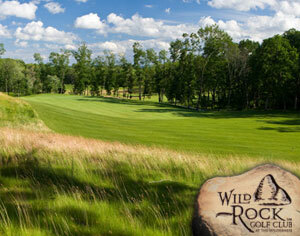 Wild Rock features dramatic elevation changes along with five sets of tee boxes ensuring a competitive round for all skill levels. Sundara guests are afforded a preferred guest rate. Our Front Desk will gladly assist with tee times. For more on the course and the award-winning clubhouse, click here. Golf Rates include taxes, green fees, golf cart, GPS, and use of practice facility.